The M1911 is one of the most legendary firearms in existence. It’s been around since the year 1911 and has fought in wars and conflicts all across the planet. Today it remains one of the most popular firearms ever produced for a variety of uses. You know the most fascinating things about 1911s? The 1911, not meant to be kept in a safe! The 1911 price and customization spectrum. You can find 1911s for 350 bucks all the way to 4k custom guns. It’s truly mind-blowing to look and see how much the 1911 varies in price. Everyone knows the big dogs in the 1911 game. The Ed Browns, the Wilson Combats, the Dan Wesson, and the other high-end custom or semi-custom guns out there. If you want one of those great, but most of us aren’t looking to spend a few grand on a single 1911. Many of us may not want to spend more 500 bucks on a 1911. This article is for those people, the people looking for affordable 1911s, dare I say cheap 1911s? We are going to talk about 1911s, why a cheap one is fine, and what you can expect from a cheap 1911. In the end, we are going to toss a few cheap 1911s your way. I do think a 1911 should be in any serious gun collector’s inventory. It’s a classic firearm that helped shape the handgun world. It really is a living piece of history. 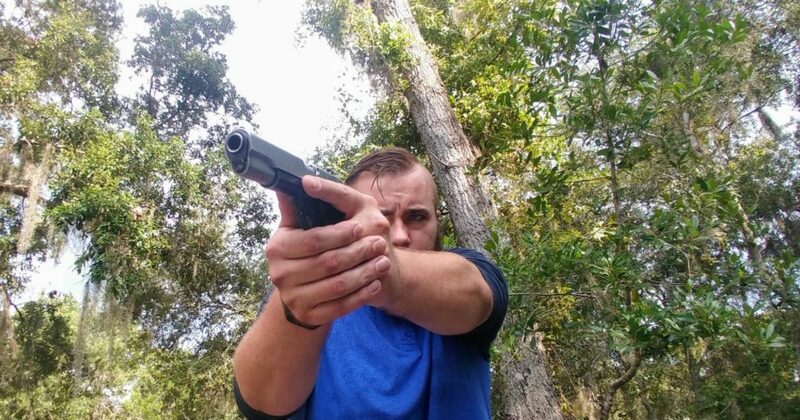 This is going to be controversial, and I’m sure I’ll get flamed in the comments, but I think the 1911 is an outdated design that doesn’t excel in the modern handgun world. It’s heavy, the capacity is incredibly limited, and the gun is nowhere near as modular as a modern handgun. The 1911 served its time as a combat pistol, but I think it’s time we move forward. 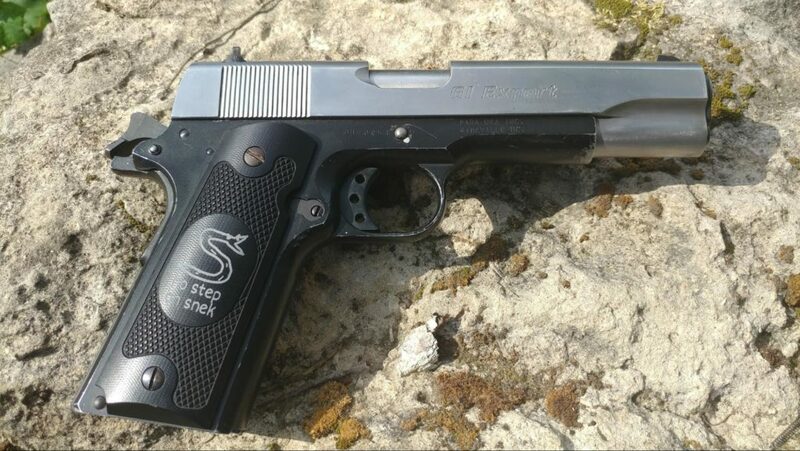 The Colt SAA served its time too and fought in many a battle, but all admit its not a combat pistol anymore. The 1911 is a fun gun and a part of history. It’s like an M1 Garand, or a Lee Enfield. If you are buying a 1911 just to be a fun gun is there really a reason to invest a thousand dollars or more into one? I don’t see the purpose in spending that much money. So if you share my opinion on what the 1911 is for then, I don’t see a problem walking a more affordable route. Another reason you may consider a cheap 1911 is to build your own 1911 basically. You can start with a very base model 1911 and develop and customize it into the gun you want. The 1911 is almost as customizable as a AR 15. Its age and popularity have given it a massive aftermarket that has spawned basically the ability to customize your gun as you see fit. 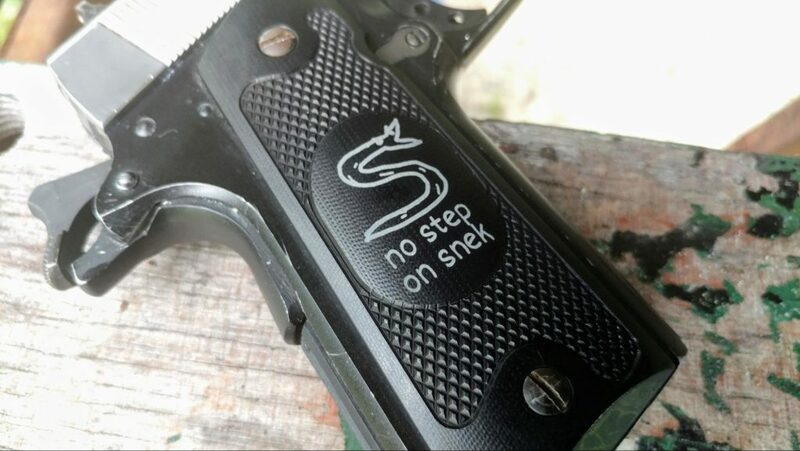 The 1911 is a cranky platform. Can you blame it? It’s over a century old, and people still buy them in droves. It is an old-school design that came from a time when craftsmanship was a thing, and guns were being fitted together versus mass produced on assembly lines. These days you can still get a hand fitted 1911, but you’ll pay for it. 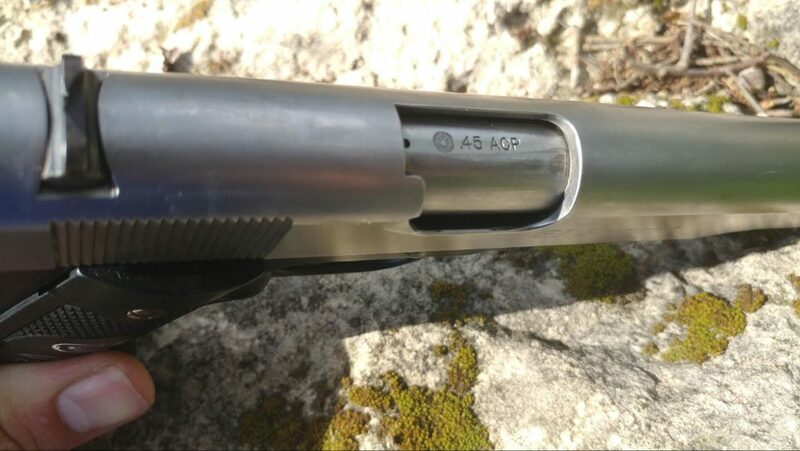 Your standard 1911 that’s mass produced can have issues, especially when it comes to tight tolerances. This results in jams, failures to extracts, failures to feed specific ammo, and more. Is this a more significant issue with cheap 1911s? In my experience no, not really. I’ve handled SIG Sauers, Kimbers, Rock Islands, ATIs, and many more across the spectrum of price and found almost all brands can have issues. Over time I’ve owned a dozen different 1911s in different calibers and different sizes. Of that dozen, I’ve had three guns that just refused to function correctly. 25% of my firearms were failures, and one was a Kimber, one was a Llama, and one was an S&W. That doesn’t mean that Kimbers, Llamas, and S&W 1911s are junk. It just meant those specific guns were junk. So if cheaper guns fail more than average priced or even slightly expensive firearms, I haven’t noticed it. Across the spectrum of prices, the most significant difference I’ve seen comes from custom shops, or semi-custom shops like Ed Brown, Nighthawk, Les Bauer, Wilson Combat and other high-end shops make great guns. These would be the guns I’d trust my life to in the 1911 world. What Can You Expect from an Affordable 1911? Typically an affordable 1911 is going to be frills-free. The cheapest centerfire caliber you can find is going to be 45 ACP, and you can usually expect to get a decent magazine or two. These guns are typically equipped with basic GI sights, but Novak cut sights are becoming more popular among affordable 1911s. Most of the time you won’t find ambi-safeties, adjustable triggers, or nice beavertails on budget 1911s. The same goes for night sights or fancy grips. What you can really expect is a bare bones gun that functions. This is my all-time favorite 1911, and its also my most affordable 1911. Seriously, of all the 1911s I own or have owned, or have even shot this is my favorite. Maybe because it was my first 1911, but I feel like its because this model is the closest I can get to the WW2 era 1911. My particular model is 12 years old, so its a little dated regarding the finish. Rock Island is using a much darker finish these days. Other than that it’s identical to the current GI series production. What does this mean? Well, it’s a bare-bones model to the core. From the wood grips to the teeny tiny sights this thing is pure GI 1911. There is nothing fancy on this gun, and that’s why I love it. It’s just a gun designed to go bang, and in my experience, it always goes bang. The gun is so simple and so close to the GI level that it just seems to work. Also, one thing I really love about Rock Island is they don’t throw up a massive wretched billboard-sized Rollmark on their guns. This is really living history. 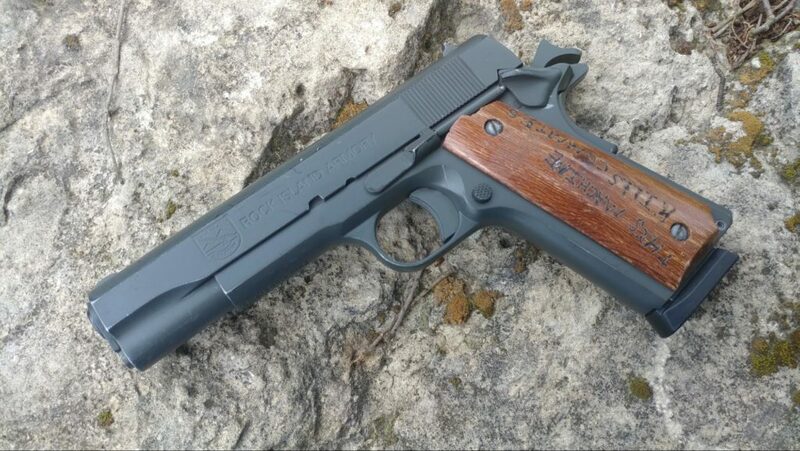 This is the closest you’ll find to a classic 1911. Plus, its easy to find well under 500 bucks. Be sure to check out our full review on the midsize edition. 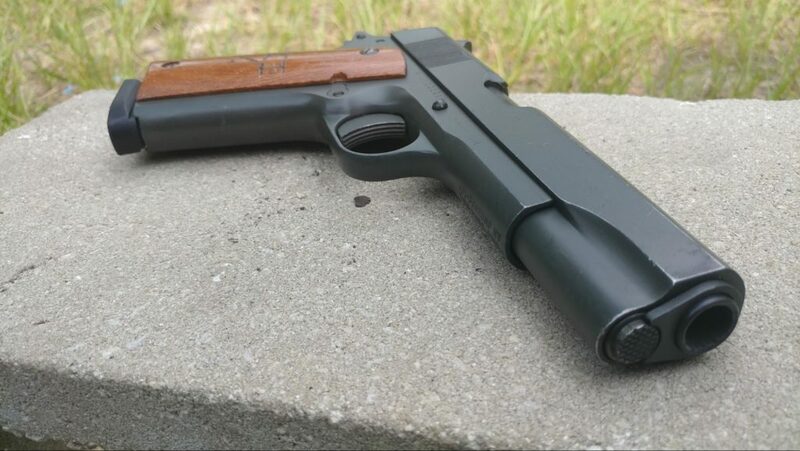 What do you think about RIA 1911s? If you want to go a little more refined, but don’t want to go too crazy the Para Ordnance GI Expert is an excellent go to 1911. It’s priced to be an entry level gun that’s a little more refined than the Rock Island series. The gun sports a skeletonized trigger and skeletonized hammer which is a nice touch that gives you a stylish appearance. The Para Ordnance GI Expert comes with slightly bigger sights than the RIA GI. 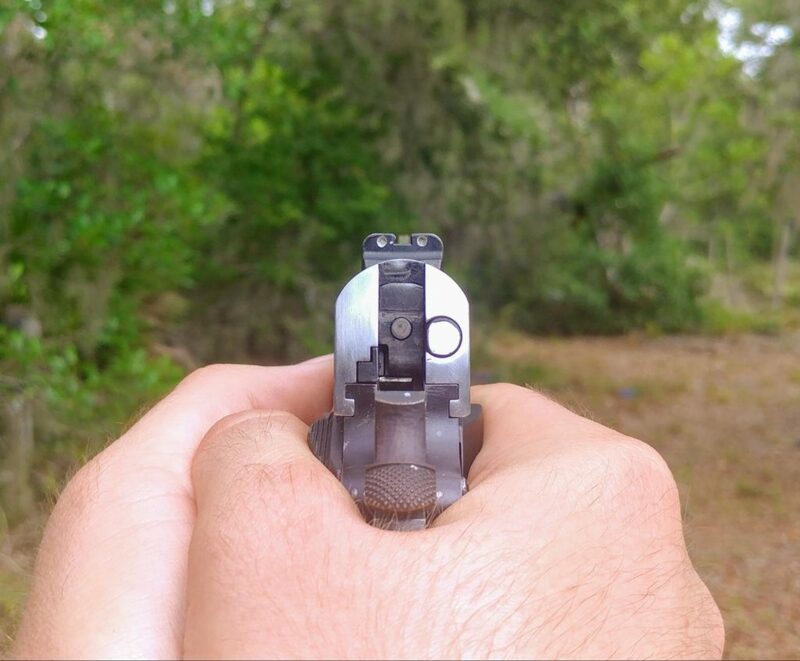 These simple 3 dot sights are easy to use, but nothing to brag about in low light settings. They are a dovetail style sight so you can upgrade pretty quickly with whatever sights you want. 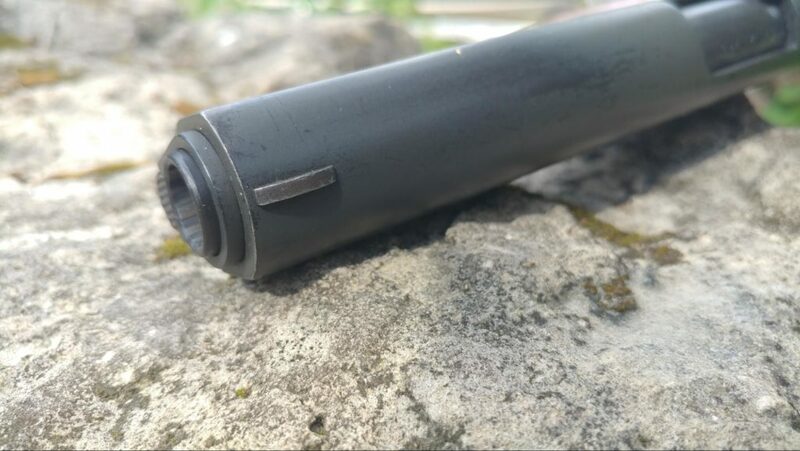 The Para Ordnance GI Expert has a stainless steel barrel that’s the standard barrel design. This barrel is not fully supported, which often aid in reliability. Although there is some debate regarding fully supported barrels and standard cut barrels. The barrel also has a nice 11-degree muzzle crown which is a bit different than a standard GI barrel. This protects the barrel in case of a fall. The ejection port is also lowered and flared for better ejection capability. All these little editions give you a much more refined 1911 that still sticks to its roots, and comes in at a great price. In my experience, Taurus has been hit or miss concerning revolvers, but I’ve never run into a bad Taurus auto, and this 1911 is no different. Their 1911s are well known to run well, and the number of features they offer at a price that is pretty impressive. Features include real Novak or Heinie sights, an ambidextrous safety, an extended beavertail, a skeletonized trigger, and safety, as well as front and rear serrations. The ejection port is expanded and lowered as well, and the gun comes in a variety of finishes and calibers. If you wanted an affordable 9mm 1911, the Taurus PT1911 is undoubtedly an excellent go-to option. The PT1911 comes in either 45 ACP or 9mm, and both are priced at under 500 dollars. These guns are likely the best value of features and design you’ll find out there. I’ve run a 9mm variant and really enjoyed it. 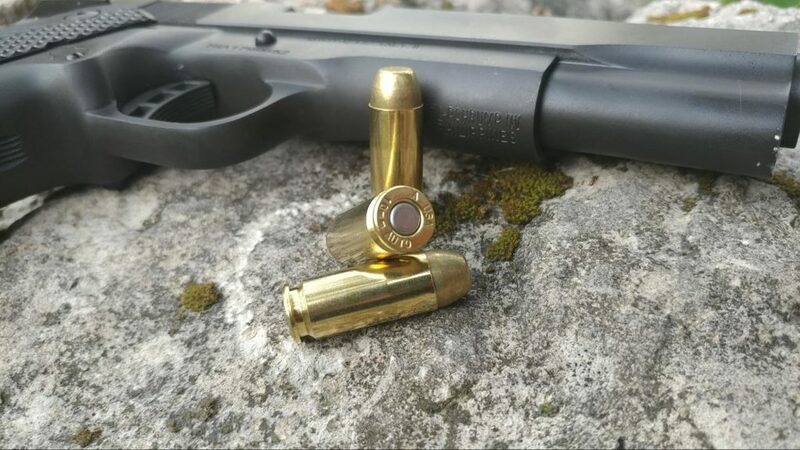 It functioned flawlessly with a wide variety of ammo, from 115 to 147 grains. The gun feels exceptionally well made, and the trigger pull surprised me at how smooth and crisp it was. This is an excellent value for a 1911, and it’s hard to beat when it comes stacking the features versus price comparison. If you really want a double stack 1911, you are going to have to spend a little many. If we agree that prices are relative to what you’re getting, then a cheap double stack 1911 could cost significantly more than a cheap single stack 1911. Rock Island Armory is the only company I know of making affordable double stack 1911s in a variety of calibers. The price on these guns runs from 650ish to 800 bucks depending on features. 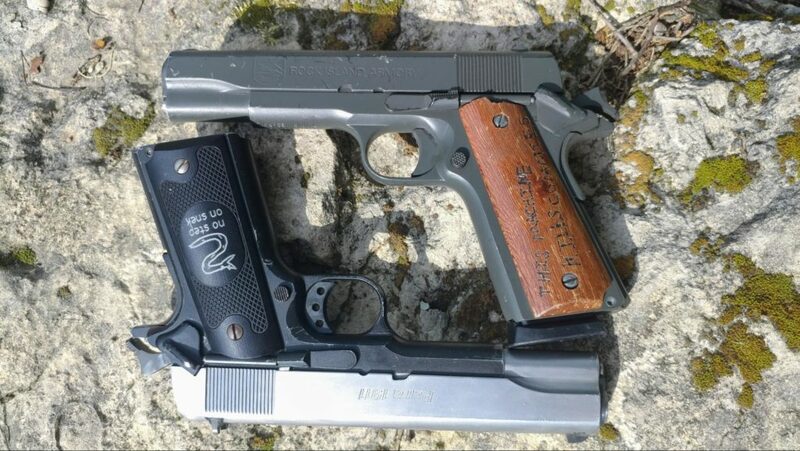 I own both a 22 TCM/9mm double stack and a 10mm double stack 1911 and enjoy them both immensely. The cheapest in the series is going to be the Rock Ultra FS HC. These guns are a little plainer, and lack rails the TAC series carries. The TAC Ultra FS HC is a little pricer, but still relatively affordable when it comes to double stack 1911s. These guns are big, huge, but they do offer you a lot of firepower. They also feature a degree of custom features you’ll enjoy. This includes a flared magazine well for quick reloads, an ambidextrous safety, a large beavertail as well as skeletonized trigger and hammer. The guns also wear Novak cut rear sights and come with adjustable LPA sights. The front sight is a high visibility fiber optics for quick sight pickup. The guns run like champs and seem to eat everything I put through them. These can be hard to find in stock and when you do, they are often blems. But they are a lot of gun for not a lot of price! Offering great value is kind of what PSA is known for with their AR-15 and AR-10s and they keep delivering on that with their 1911s. 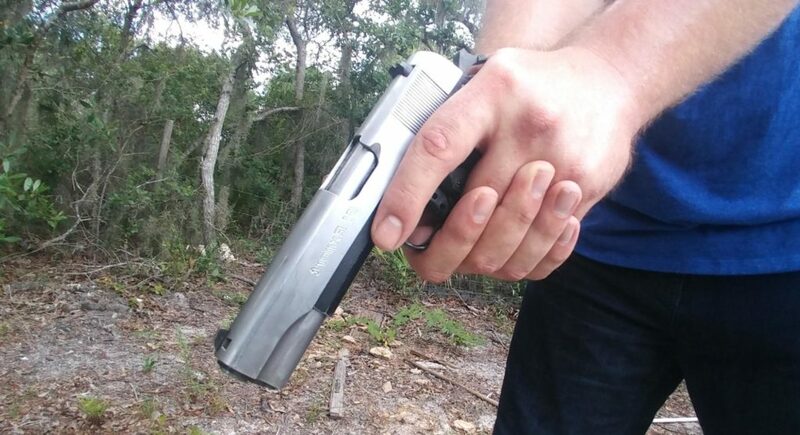 We haven’t had the change to fully review one of their 1911s…yet. However…we’ve had a few mags through one of their 1911s that made short work of short distance steel and was hitting 50% IPSC plates at 100 yards. Good enough for me! We’ve also been impressed with everything else in the PSA line-up that we’ve put our hands on. Check out our reviews of the PSA AR-15 and AR-9 PCC. Okay, okay, is the Colt Mustang Pocketlite .380 really a 1911? It’s surely not a traditional 1911, but it looks like one and essentially handles like one, so we’ll call it one. The Pocketlite uses a polymer frame, which may seem like heathenry to a 1911 purist. Unlike the traditional 1911, the Pocketlite is a blowback operated firearm. Blowback designs and .380 ACP go together like peanut butter and honey. It functions, its small, and its reliable. The Pocketlite .380 is a teeny tiny gun that’s designed for concealed carry. It’s certainly small enough to fit in the pocket. The weapon has a 6+1 capacity and does away with the grip safety found on most 1911s. You do have a thumb safety, as well as a firing pin block. The gun has a rear dovetail sight and a front sight that’s actually integrated into the slide as a slight ramp. The Colt Pocketlite is an interesting take on the 1911 and is undoubtedly a capable CCW. If you want a smooth SA trigger, combined with the slim style of a 1911, this is by far the most affordable option. Plus it’s an authentic Colt. Of all the guns on this list, I would go with this model as a carry gun. It’s affordable, but it’s also small and uses polymer. That cuts the price a bit without sacrificing quality. Before we take off, I wanted to point out a few fun and affordable 1911 upgrades for the 1911 fan on a budget. Most of these aren’t duty grade upgrades and are better suited more for range time and having fun with your gun. You can actually add an optic for under 300 bucks if you know what to look for. Trijicon makes an Adapter for Novak cut sights that replace the rear sight with an RMR mounting plate. An actual Trijicon RMR is expensive, but a variety of optics use the same pattern for mounting an RMR. Combine that with a Burris FastFire 3 and you have a very nice set up for a low price point. If you’re looking for something to shoot competition with or to rely on for home defense – you’ll want something like the Vortex Venom. You can read the full review of the Venom and our other top picks for pistol red dots in our Best Pistol Red Dot article. If you are running a budget 1911, it likely doesn’t have a rail to accommodate any kind of light or laser. Adding one without permanently modifying your gun is possible with the Recover Tactical grip and rail system. These polymer grips actually add a rail to your dust cover. They make the design a little bit bulkier than average, but its a very cost-effective way to add a rail to your gun. I was surprised at the durability and function of these grips. While they seem a little cheesy, they do work as intended. Recover even produces a holster designed for carrying a light equipped 1911 with the Recover Tactical grips on it as well. If you just want to spice up your grips, then you can always call on Magpul. 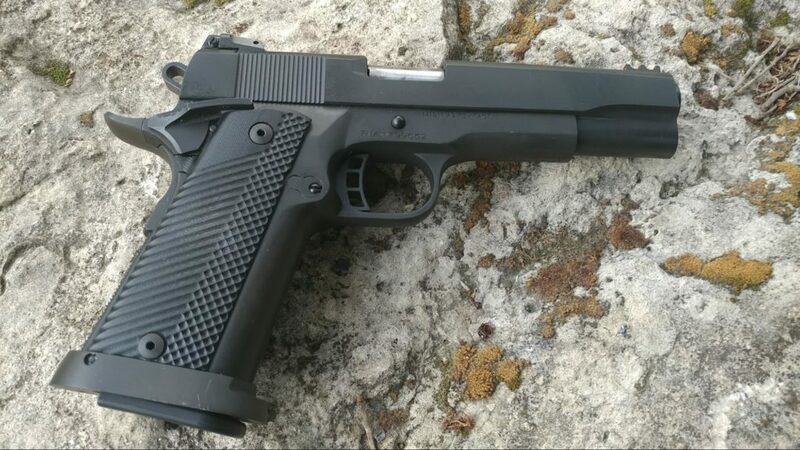 Everyone knows Magpul, but it seems like not many people know they make 1911 grips. 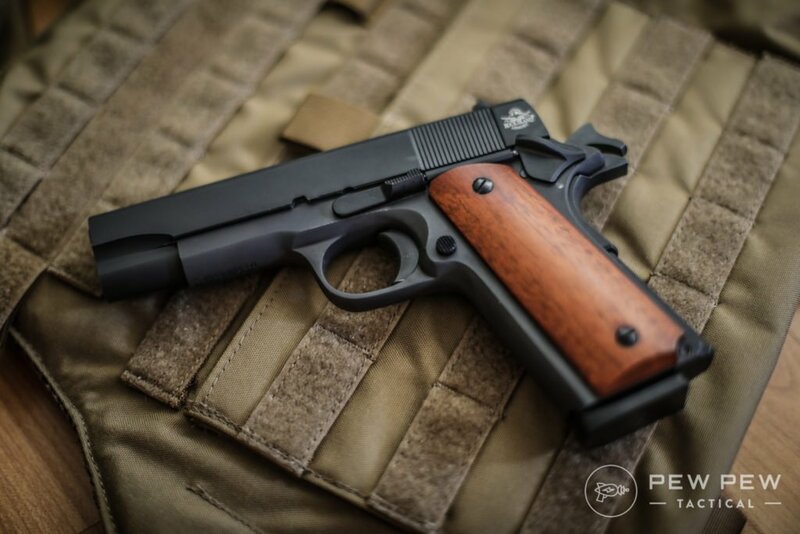 These polymer grips are simple, comfortable, and affordable. They look nice and come in a variety of finishes. Magpul has always made good gear, and I doubt they’d make anything that sucked. The 1911 is a fun platform. The all-metal design, the single action trigger, and the big ole’ 45 ACP all come together to make something uniquely American. The good news is 1911s don’t have to cost an arm and a leg. They certainly can, but you have a ton of different options at almost any price range. If you are just looking for a fun gun for the range or the collection I wouldn’t hesitate with a more affordable 1911 option. What is your favorite 1911? Do you EDC one? Let us know in the comments! Being as a 1911 was the first weapon Uncle Sh!tty issued me in 1982, I will always own one. After owning 4 or 5, I’ve settled on a Springfield Armory “Loaded” in .45 acp. It’s equipped with one of the Recover Tactical CC3P grip rails and I f’n love it. It’s my bedside and when I absolutely have to deal with what’s left of “humanity”, I slide off the light and it still fits in my shoulder rig.